Conservation volunteers in Asia have cleared 162 illegal animal traps that are a danger to rare Amur tigers. Dozens of Chinese volunteers helped the Wildlife Conservation Society (WCS) workers to clear the wire snares left by poachers in Heilongjiang Province, in the northeast. The environmentalists carried out the work to help protect the Amur tiger, also called the Siberian tiger, of which there are estimated to be only 20 left in China. WCS Director of Asia Programs, Joe Walston, says, "It's heartening to see a new generation of environmentally committed young Chinese willing and able to volunteer their time to do something challenging but important for their country's natural heritage. "Tigers need our help whether it's from grass roots efforts like these or governments putting more funding toward enforcement." The Amur tiger is the world's largest cat. In the 1940s, there were believed to be only 40 animals left, but thanks to conservation efforts, there are now believed to be around 500 Siberian tigers in the wild, mainly in China, Russia and North Korea. Last year, it was estimated that the genetic diversity of the population was so low that there were effectively only 14 breeding pairs left. The low genetic diversity makes the Siberian tigers vulnerable to genetic disorders and disease and means that are more likely to pass them on to the next generation, further weakening the population. The magnificent tiger (Panthera tigris altaica) can weigh up to 600 pounds and be up to nine foot in length from nose to tail. Their upper body is tinged with red/orange or ochre shades with a whiter underside. Its stripes are block or dark grey. The 59 volunteers, including doctors, IT engineers, government employees and students worked for six days in January in deep snow and freezing temperatures to clear the traps. The snares are meant to catch deer or rabbits, but occasionally trap tigers. One was found dead in a snare near Mishan, in Heilongjiang Province, in October 2011. 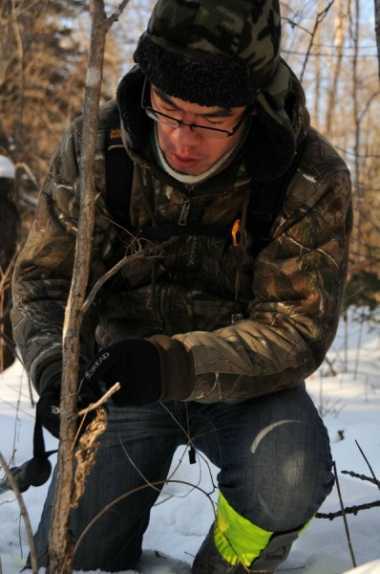 The campaign to find and destroy the traps was organised by the WCS in conjunction with the Forestry Department and Forestry Industry Bureau of Heilongjiang Province and Harbin Newspaper Company. WCS says it is encouraged by signs that Amur tigers are travelling from the far east of Russia, where several hundred remain, but it says it is vital that any poaching and illegal trade of tiger parts in China and elsewhere is stopped. The WCS was founded in 1895 and is an American-based global conservation body that aims to save wildlife and wild places across the world. Several American government agencies backed the tiger conservation scheme, including the US State Department, Forest Service and Fish and Wildlife Service.